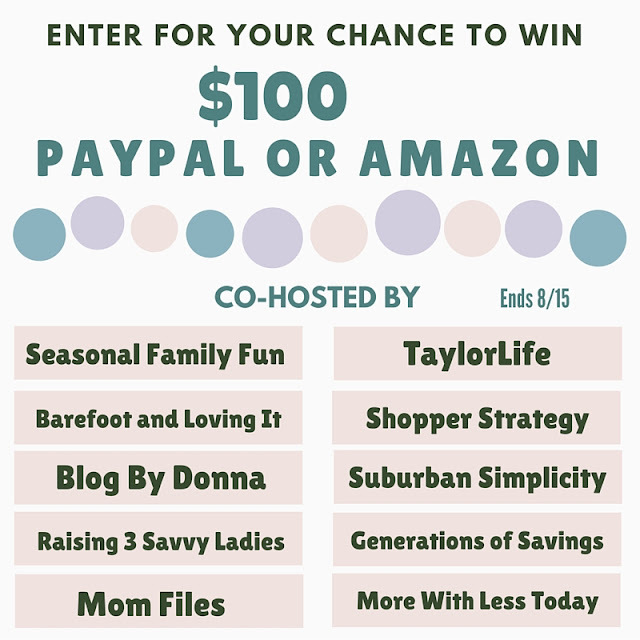 I'm excited to have teamed up with some amazing bloggers for this giveaway. You have a chance to win $100 for Amazon or Paypal. Who couldn't use $100 towards summer plans or school supplies. I now have 2 kids to shop for this August. I thought sending one kid back to school was expensive but now my daughter will start pre-k. She will want a cute back pack. Of course, the kids will need new clothes. This all adds up. Supplies alone could cost over 100 depending on how many kids you are shopping for. You can find a lot of good items on Amazon. These days many people do most of their shopping online because you can avoid the crowds and lines in the store. This giveaway starts August 1, 2016 and ends August 15, 2016. USA, 18+. One winner will be randomly selected from all qualifying entries and contacted via the email they provide. The winner has 48 hours to respond or new winner will be chosen. The winner will be announced on the rafflecopter after they have responded. Awesome Giveaway. i sure could use 100 for school shopping no doubt.